These lovely clear glass jars would light up your guests tables and they can take them home after the wedding as a lovely keepsake of the most precious day of your life. 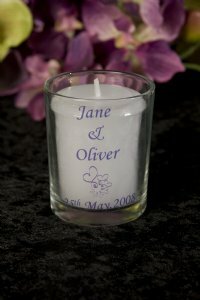 The bride and groom's names are transferred cleverly onto the glass together with any image you would like and the date of your marriage. There are limitless colours available for you to choose from. Prices: 10-20..$6.00 each, 20-30..$5.50 each, 30-40..$5.00 each, 40+...$4.50each.